In some ways, U.S. Muslims who identify as Republicans are demographically similar to Muslims who are Democrats. For instance, similar shares in both groups are under age 40 (58% vs. 60%) and are immigrants (52% vs. 57%). There are some demographic differences, however. U.S.-born blacks make up a smaller share of Muslim Republicans than Democrats (6% vs. 15%). Republican Muslims are somewhat less likely than their Democratic counterparts to have graduated from college (22% vs. 36%). There also are some differences in their views of important issues, including immigration. Muslim Republicans are much more likely than Muslim Democrats (45% vs. 11%) to say immigrants are a burden to society because they take jobs, housing and healthcare, according to a survey conducted by the Center between January and May 2017. 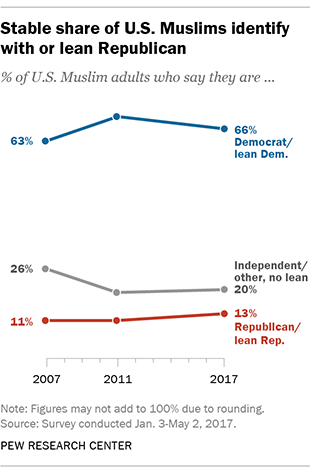 There also is partisan divide on this issue among those in the public overall, according to a separate survey conducted in June and July 2017. Republican Muslims in general are also more likely than Democrats (50% vs. 23%) to say they prefer a smaller government with fewer services. But the partisan divide on this issue among Muslims is narrower than it is among the overall public. On other questions, such as views of homosexuality, or on measures of household income and religious commitment, the Center did not have an adequate sample of Muslim Republicans to measure partisan differences. 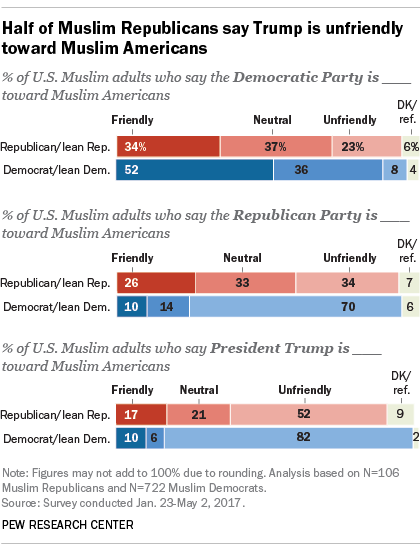 As might be expected, Republican Muslims are less likely than Democrats to see the Republican Party generally, and President Trump specifically, as unfriendly toward Muslim Americans. Still, sizable shares see their own party – and Trump – as unfriendly. In the 2017 survey, around half of GOP Muslims (52%) said Trump is unfriendly toward U.S. Muslims and about a third (34%) said the same about the GOP in general.